Today we are interviewing J.M. 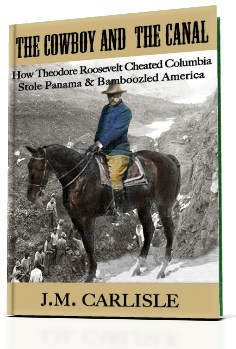 Carlisle, author of the American history book The Cowboy and the Canal: How Theodore Roosevelt Cheated Colombia, Stole Panama, and Bamboozled America. The book explores the dubious behavior of America’s favorite Cowboy-hero, Theodore Roosevelt, as he bullied his way into the purchase of the bankrupt French Panama Canal Company by the United States in 1904. Traveling full-circle from the earliest quests to pierce Panama by Spanish conquestadors, the story concludes with Roosevelt's attempt to revive his faltering Presidential fortunes as he begins his Progressive Party campaign tour the day of the official Opening of the Panama Canal, August 15, 1914. Unanswered questions from my Ph.D. research. What was the most interesting fact you uncovered while doing research for the book? How the process of myth-making can erase history. Has your view of Theodore Roosevelt's presidency changed as a result of your research? Yes and no. I began my dissertation research believing he was really a harmless, self-promoting, wind bag and although he was that, I underestimated the maliciousness of his character and his genius for using mass media to accomplish his goals. With an eye toward the 2016 elections, Roosevelt's rejection by his own "Bull Moose" Progressive party for the 1916 presidential nomination. Who is your favorite historical figure to study? Wow! That question is too big for me! I am attracted to Periods and then the People within in periods. Like Eleanor of Aquitaine in the 12th century, Klaus Von Clauswitz in Napoleon Bonaparte's time, Joseph Pulitzer, Bill Cody, Edith Wharton, in the Gilded Age/Progressive Era, the Flores-Magon brother in the Mexican revolutions… I guess I like to study people who play a role in the broad political or social events that change or define an era. What got you interested in Progressive Era history? The cultural shifts and schisms that took place around technology and the changing social roles for women seemed to me to be a template for what was happening at the turn of the 20-21st centuries. Do you think the rise of technology and the subsequent increased ease of accessing information has had any impact on Americans' interest in history? What a great question! The answer form my point of view is "it always has." One of the supports of TR's rise to power was print media and film and audio recording. Media exploded in America. Everyone read something. Literacy rates were sky-high and growing. Dime novels, penny news papers, magazines, catalogs, wire services, telephones, moving pictures, audio recording all were easily and frequently accessed by the public. It was an astonishing display of technology delivering and creating history at the same time. It's the same today only the scope is narrower because the opportunity to see news or understand historical contexts is limited to pre-selections by the delivery platforms. For example, I only know what's trending on Twitter based on who I'm following. It challenges the closely held beliefs about one of America's most iconic heroes.